Romance and flowers will always be a part of your life with this deco floral bouquet diamond engagement ring. This lovely white Old-European diamond wedding ring shines brightly when light reflects from twenty old diamonds (appx 0.65 ct tw). These Old-European diamonds and single cut diamonds are mounted in this rounded-square-head flower bouquet gold mounting. 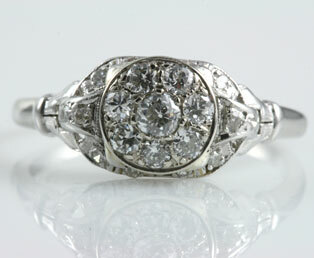 This early 1900s, tiered estate 14kt white gold mounting has open work siding.